This hotel is located in the Harburg district, in the south of Hamburg. Hotel Heimfeld offers retro-style rooms with free Wi-Fi and a traditional bar with wooden furnishings. 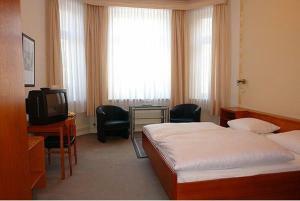 All rooms at Hotel Heimfeld - Retro Design feature a TV, telephone and a private bathroom with shower. A buffet breakfast is provided every morning in the homelike breakfast room. On-site parking is free for guests. The Heimfeld junction of the A7 motorway is just 3 km from the hotel. Heimfeld S-Bahn train station is a 10-minute walk away.